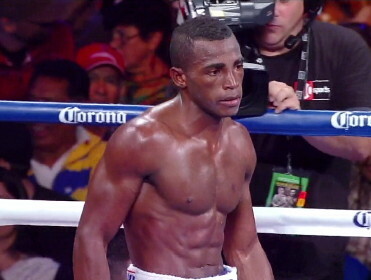 By Dan Ambrose: Erislandy Lara (18-1-2, 12 KO’s) vs. Austin Trout (26-1, 14 KO’s) is being talked about for the Floyd Mayweather Jr. vs. Saul “Canelo” Alvarez card on September 14th. It’s still not a done deal, but it’s a possibility as either the co-feature or the third fight below the main event if Golden Boy Promotions is able is able to get the Danny Garcia vs. Lucas Matthysse on the card. If they can get that fight, and that’s a big if, that fight will be the co-feature bout. The Trout-Lara fight is a good one, but not nearly as good as the Garcia-Matthysse bout. Trout should arguably be still undefeated after losing to Canelo by a 12 round unanimous decision last April. If you Canelo’s fans, they think Trout lost the fight, but if you ask a lot of people without a preference about the fight, a lot of them are saying that Trout won the fight. Under normal circumstances, Canelo would simply face Trout again in a neutral venue and the fight would be redone, but it looks like Canelo’s satisfied with his controversial win and his promoters at Golden Boy aren’t eager to put him back in with Trout again given that they didn’t want the fight in the first place. The winner of the Trout vs. Lara fight should ideally get to face the winner or even the loser of the Mayweather-Canelo fight, but that’s not going to happen. Mayweather will move on if he wins and fight guys in the 147 lb. division; whereas if Canelo wins he’ll likely be matched against a past his best Miguel Cotto or more likely one of the light welterweights like Matthysse or Danny Garcia. In other words, it would be like a replay of Canelo’s fight against 140 lb. Josesito Lopez where he has to move up to 154 to fight Canelo, and end up giving up a ton of weight to him. Cotto might not want to fight Canelo, so that bout might not happen. But I can see Golden Boy luring Matthysse or Garcia from 140 to fight Canelo at his weight at junior middleweight. That fight would be a farce unless there was a strict rehydration limit to keep Canelo from rehydrating to the mid-160s or 170s.